Say goodbye to Google Place Pages, and say hello to Google+ Local Pages. That’s the name for Google’s new baby — a result of the marriage, or merger, of Google Places and Google+. It’s the main part of several related announcements today from Google. As I’m writing this late Tuesday night, there’s no link yet for me to send you to, so let me suggest you check out Greg Sterling’s detailed overview of the news on Search Engine Land – plenty of information, screenshots, etc., in his article. Update: Google’s announcement is here. About 80 million Google Place Pages worldwide have been converted into the new Google Plus Local Pages. If you had a Place Page, it’s gone; you now have a Google+ Local Page, instead. Merchants will continue — at least for now — to manage the pages via the Google Places listing center (or whatever they’re calling it these days). Reviews of your business are getting more sophisticated because Google is adding Zagat’s 30-point scale/score to your Local Page, and getting rid of its old 5-star scoring system. The Zagat scores will show up next to your business on Google.com searches, Google Maps, and on mobile devices. 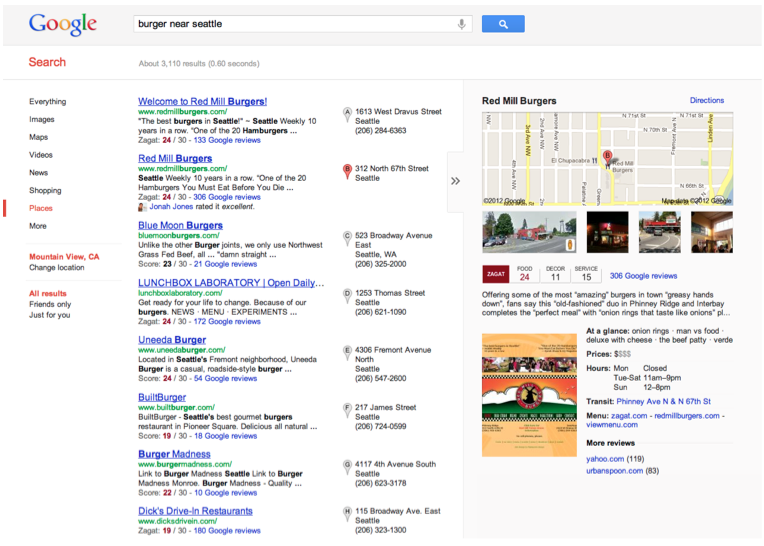 Google+ Local Pages are being indexed and will show up in Google’s search results — probably quite visibly. Google Place Pages were blocked from showing in search results, primarily because Google considered a Place Page to be a search result itself. There are obviously big implications where local SEO is concerned. I need to think through this some more but it appears that we’ll need to start talking about how to optimize a Google+ Local Page since it’s being indexed. David Mihm and I recently wrote speculative pro and con articles about how Places and Plus would integrate, but neither one of us accounted for the complete elimination of Place Pages, their replacement by Google Plus Local Pages, and the new pages being indexed. Here are a few screenshots from a Google media presentation. The first two show Google.com and Google Maps search results, and the third shows the new Google+ Local Page. As I mentioned, Greg Sterling has a lot more screenshots and details on Search Engine Land. Does Google consider these search results? Presumably not, since they’re now being indexed. Hopefully that means business owners won’t have to put up with seeing their competition listed in the “Related places” section like on the old Place Pages. 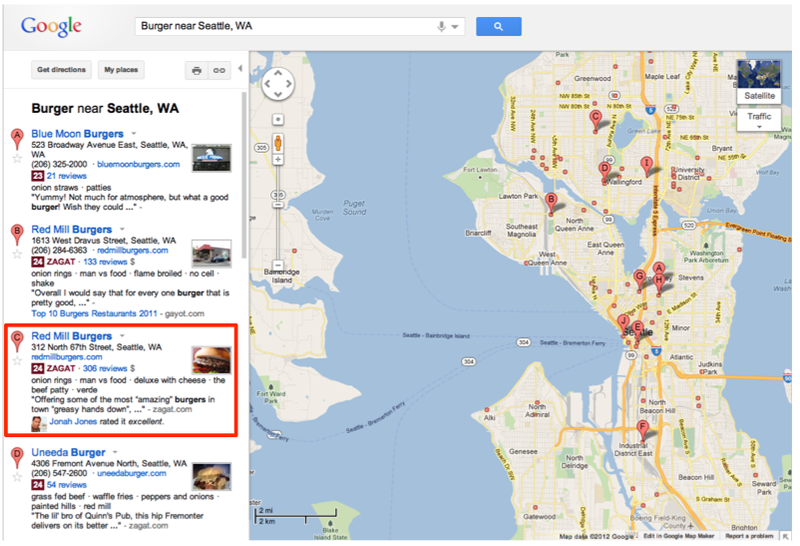 Will competitor ads eventually appear on Google+ Local Pages? Right now there’s no advertising on any Google+ page, but that will certainly change at some point. How will Google protect against the all-too-common problems like merged listings and messy data? 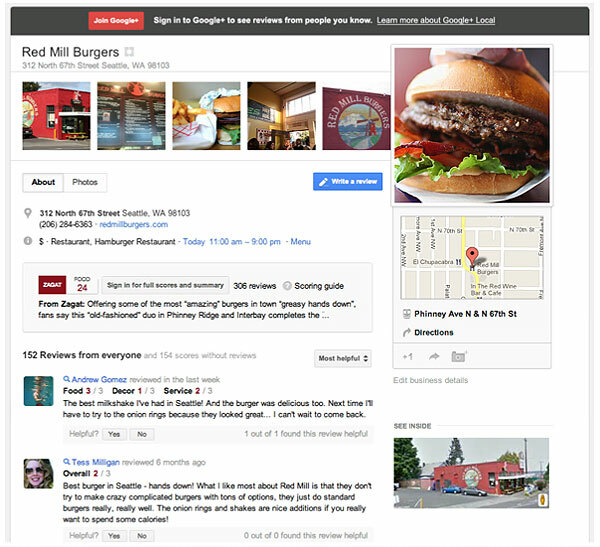 It was one thing when Place Pages were merged, but it’s a whole new ballgame with Google+ Local Pages. If two pages are merged, Company A could suddenly have access to Company B’s followers, not to mention the ability to post updates via Google+. It could be a disaster waiting to happen. T this point it appears Zagats marries Google Places is the big deal so far. without a Zagat rating, what changed? Matt, one point of clarification…I DID speculate that Local Plus pages would replace the current iteration of Place Pages…what’s weirder to me is that that does NOT seem to be true yet as you can still reach traditional ?cid URL’s from Maps.google.com and they’re even linked to from the handful of Poster Child Local Plus pages that Google has trotted out. Thx David. I must’ve missed your suggestion about the replacement of Place pages. Google is now saying the new Plus pages will replace Place pages over the next couple days. So if I am reading this correctly a google places page is getting converted to a google+ local page. Is this functionally the same as a Google+ plus page? If so will there be a merger of an existing google+ plus accounts for businesses and their google+ local pages? Once that gets sorted out, what about businesses with multiple locations who have presumably set up multiple Google places pages to SEO their individual locations? While it’s wise to SEO individual locations, individual full scale Google+ accounts for each location may or may not fit within the business needs. 1) Yes, eventually the functionality should be the same. But it’s not right now from what I understand. 2) I believe there will also be a way to combine/verify existing G+ pages with the Places account. 3) In Greg’s Search Engine Land article, I think there’s a Google quote about them planning to (try to) support multiple locations. That’s all I know. I love your 3rd point under the “unknowns”. I didn’t even think of that scenario. I’ve found I can still get the Places URL if I search the business on Google, but if I search on Google Maps, every link I click (more info, the reviews etc.) takes me to a G+ URL instead. I’m trying to find out in the forum which URL you report to Google for duplicates/data issues etc (if they even have a preference). I’m also trying to get confirmation on if you need to have a Google Plus profile now in order to leave a review or if you could still leave one if you just had Gmail. I know most consumers have gmail but way less have G+. Joy – it looks like right now the rollout is only visible from Google Maps, but regular Google.com searches are still pointing to Place Pages. At least as of 2:45 pm PST. I forgot to add that another thing I noticed is that when me and one of my coworkers left a review using Google Plus on one of these pages, neither of us could see each other’s review on the G+ version of the listing or on Google Places unless we were logged in. He couldn’t see mine, I couldn’t see his. When we both signed out, neither were there. Now, a couple hours later, I see both the reviews on the Google Places version of the listing and they show up at the bottom below the other reviews that were there from before. So my big question is exactly how this is going to happen? I have a G+ account and have created a G+ Business page – will Google automatically merge them for me, or will I have to do something? What about the images and videos we have on each separate page if there is some overlap, but not identical? Charles, I’m not sure about the actual process – if you’ll do it yourself or if Google will do it. I’m not sure if Google even knows. But they keep saying to be patient and it will happen … someday. Stella — yes, that’s true. Have to use a Google+ account now to leave reviews. What I’d like to know is that are users required to have a Google Plus account in order to leave a review? Not everyone has a Google+ account. It’s still not as popular as Facebook. I’m concerned that people might feel discouraged to give a review because of having to register for yet another account. For local business owners who focus on their Plus profile plus linking their site to their plus profile through the Authorship function I believe Google will also provide them with a bump in SERP’s over those business owners that ignore these matters. In short, I believe the SERP’s in Google are going to reflect rewards for those who play by Google’s game with Google+. The un-answered question is will the SERP’s reflect quality and relevancy with all these changes at the big G? Google states that this is their top driver but it really remains to be seen. Here in the UK – not seeing this happen yet? The new LOCAL tab appears down the left hand side in Google+ account. But no means yet to edit the Places/Local listing?? And perhaps the most interesting thing is the rollout of Google Business Photos; essentially it’s Street View inside business premises. Pretty neat.